Availability of all documentary components, including test results, certificates and warranty cards, as well as warranty and post-warranty service. German standards compliance. Accuracy, attention to details and fundamentality. The presence of a dedicated production line allows to control the release of the product, starting with the raw materials and ending with the test. Service and delivery. Well-developed and easy-to-use site information system. Professional management. Stable logistics ensures that the order is received on time. Motorherz is a wide range of models, the opportunity of choice and selection with guaranteed result, interchangeability of components. Engineers of the corporation work on the quality of products every day. In 2016, we reduced the defective by 4%. This is a high indicator for technically complex products. Each box contains detailed installation instructions. We cared that you have fewer errors. Correctly installed parts reduce costs and extend the life of the entire mechanism. If the defect was not caused by installation or incorrect using, Motorherz provides a 12-month warranty for all products. Recovered spare parts Motorherz-only products suitable for further factory remanufacturing process. Quality units for replacement of exhausted original equipment. A full cycle of diagnostics, remanufacturing, pre-sale preparation and product testing is carried out, which is a guarantee of reliability of the offered parts. Electric steering racks - production by remanufacturing method, with a check of electronic, computer diagnostics, with adherence to quality of a complete bulkhead and checking the operability and wear resistance of components. Full manual bulkhead and unit check. Reengineering allows you to abandon production materials containing substances harmful to humans and nature, as well as abandon obsolete technologies and production processes that are not environmentally friendly. Remanufacturing allows reducing the amount of harmful emissions and production wastes to the environment, by reducing the production cycle during the processing of products, instead of releasing a new one, where appropriate. All products are anew redesigned by experienced engineers of the company taking into account the revealed features in the operational period. Accurate calculation of the load, including climatic conditions, allows you to create truly reliable components that guarantee a long service life of spare parts, and as a result, a confident and safe operation of the car. Motorherz GmbH Company is represented by a wide dealer network in Europe and Asia and constantly works on increasing the number of partners, improving the quality of customer service, expanding the products range. All products are checked at every stage of manufacturing, which makes it possible to timely identify defects and eliminate them. The choice of material and high technical equipment of production lines guarantees the quality of the products. The technology of test and quality requirements, used by German engineers, do not allow trade-offs in safety matters. Motorherz is the only engineering community that has developed and implemented innovative technologies in the production directions of the steering: linear production of new units and remanufacturing of original, previously operated in work. The method of cold stamping used in the manufacture of the steering rack makes it possible to make it so durable that it effectively resists strong lateral impacts. In the manufacture of metal components such as thrusts, shafts, distributors, hulls and other power systems of the node, a kind of heat treatment is used, which consists in achieving dissolution of the phase existing at a low temperature in the composition of the metal, this process makes it possible to release a more durable product from the conveyor. The rubber-technical products are manufactured taking into account the protection from chemical and climatic damages due to the reliable composition. Engineering department Motorherz conducts continuous work on research and development of materials with the purpose of improvement of such parameters as wear resistance, friction, inertia, efficiency, recoverability. Equipment with computer control provides high accuracy in the processing of body parts, as well as uncompromising quality of casting. 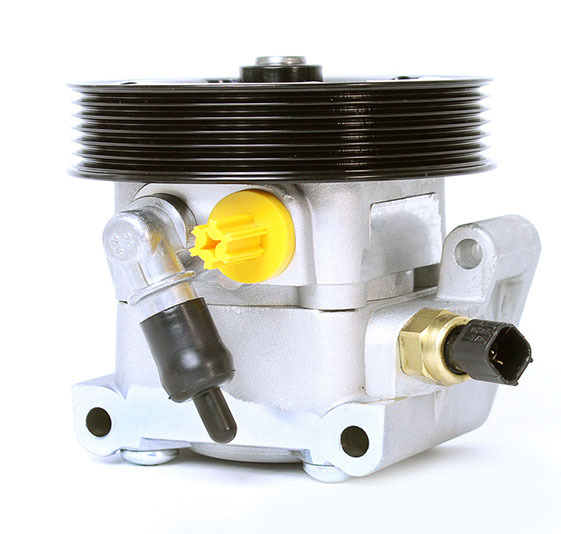 The line of hydraulic steering pumps covers 80% of the auto market. The factory constantly works on expanding the assortment in the steering segment. A careful choice of material and high technical equipment of production lines guarantees quality. The technology of test and quality requirements, used by German engineers, do not allow trade-offs in safety matters. Putting the Motorherz pump can be sure, replacement will not be required soon. However, in case of repair engineers took care of all the necessary mechanisms. Complex and rare components are available. We meticulously evaluate the quality with which processing is carried out to increase wear resistance and resistance to high temperatures. The qualitative work of the turbine is achieved due to precise final processing. The size and properties of the surface in this case are most accurately taken into account. As basis of origin brand cardiogram MOTORHERZ laid its external similarity with "timetable" of heart — cardiogram. In contrast to the human cardiogram, iron heart MOTORHERZ running absolutely stably and smoothly. That&apos;s why brand cardiogram MOTORHERZ — has a perfect, symmetrical and smooth a row of "waves", showing stable and efficient operation of all systems. Designed to verify workability diodes in the rectifiers of the alternators. With a tester D-320 it is possible to identify not only completely failed (punctured diodes or diodes with a cliff), but also partially faulty diodes, defects which it is impossible to determine with conventional multimeter. 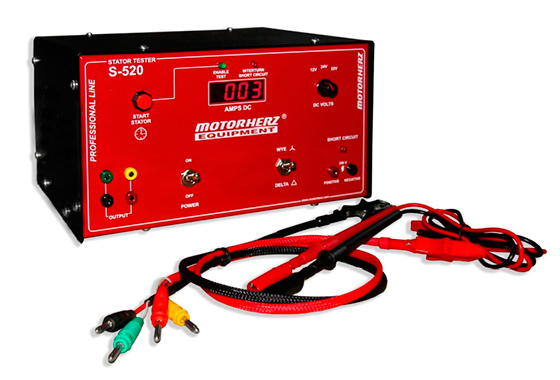 Alternator stator tester Motorherz Equipment S-520. It is designed to check workability of the alternators stator tester included by the star WYE or by triangle DELTA, designed to work with voltages of the vehicle on-board network of 12V, 24V or 32V. 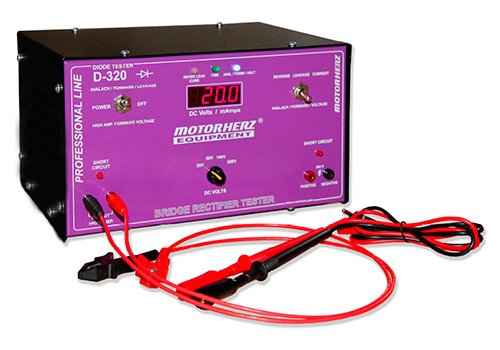 Checking one winding when using the Motorherz S-520 tester takes no more than 1-2 minutes. The voltage of the tester is 220V-240V. The maximum power consumption is 100W. 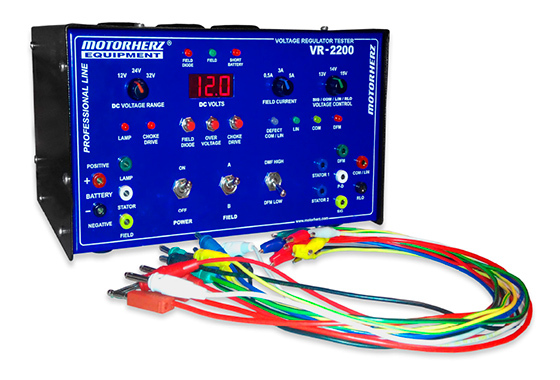 Designed to test without installing on car, workability of alternators and starter motors of cars and trucks with on-Board network 12 and 24V and measure their electrical parameters. Power supply of stand is made from AC 220V or 380V (depending on version of manufacture). The stand is equipped with an electronic control of an engine, providing smooth starting and stopping of the engine, a smooth adjustment of revolutions of the pulley of the motor from 0 to 3000 rpm in direct and reverse modes. The maximum load current when testing alternators - up to 155A (up to 200A in controllers with variable voltage) provided by the incorporation of 5 independent active load modes (in the version of the stand to the power supply 220V maximum load current when testing alternators - up to 105A (up to 140A in regulators with adjustable voltage), in the stand is provided by validation is not only power, but information outputs of modern alternators: L (D+), P-D, FR-SIG, DFM (LOW and HIGH), RLO, BSS/LIN COM and. Also provided verification of alternators with external voltage regulators A and B types. On devices of the stand during the measurement process occurs visual digital readout of the measured (current and voltage) parameters. It is intended for determination of working capacity and measurement of voltage of stabilization of electronic voltage regulators of automobile alternators with voltage of onboard network 12 and 24 volts. The device greatly facilitates the search for a malfunction of the alternator as modern voltage regulators are complex electronic devices and do not lend themselves to direct measurement of parameters. The use of modern equipment and the introduction of advanced technologies for the preparation of raw materials and processing of materials allows you to obtain high quality of products at the output. The production process is built into a consistent technological chain, engineering solutions are used to improve the products. 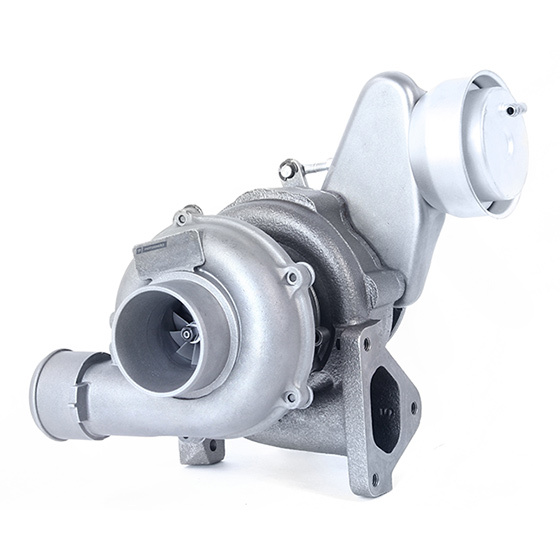 To resist high temperatures and resistance to destruction, the turbocharger body is made of spheroidized cast iron. Technologies are used that allow changing the geometry of the turbine, which allows redirecting the geometry of the nozzle of the turbine, as a result of which the engine power increases many times. Development and installation of new bearing blocks, which reduce wear due to frictional force. Reducing the mass of the turbine, by turning parts and replacing parts for others made of lighter materials, high-strength heat-resistant and lightweight ceramics, for example rotors. Separate calculations are made in the manufacture of steel rings, as a result is pass very careful calibration, for the uniform distribution of the load on the bearing. Into compressors turbine&apos;s wheels are covered by alloy of Nickel and they melted from heat-resistant materials that allow to work at temperature up to 760 degrees. Turbine wheels are well resistant to corrosion, deformation and have a high degree of wear. All the alloys are selected taking into account the features of various compressors. To perform the work, we resort to the method of vacuum or sand casting. Checking operability of the diode, a chain winding of excitation of the voltage regulator "FIELD DIODE"
Checking operability of a chain lamp signaling of the voltage regulator "LAMP"
Short-circuit protection between the terminals "BATTERY POSITIVE" and "BATTERY NEGATIVE"